Elim Manor's property manager, Sonja Zahnle, right. Homeport's first State Auto-sponsored Strengthening Communities Bus Tour for 2018 had over 20 participants on March 7. 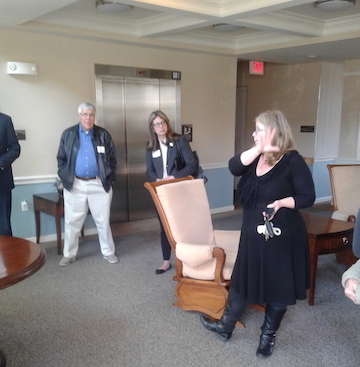 Community organizations and businesses as well as members of Homeport's Board and staff visited Homeport multi-family and senior communities Marsh Run and Elim Manor as wells as new single family homes being constructed in Milo-Grogan. Homeport Housing Advisor Kerrick Jackson, far right, teaches class. 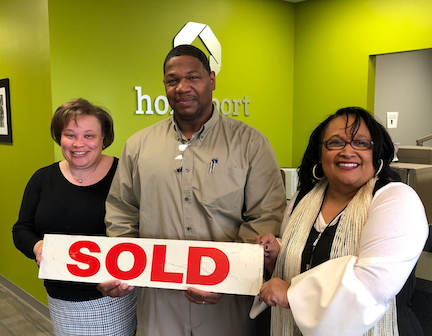 Housing Counselor Kerrick Jackson took Homeport's popular homebuyer education class on the road in March to the Ohio State University Wexner Medical Center's CarePoint East facility. Eighteen individuals came on March 10th and 17th to learn critical aspects of purchasing a home. Individuals interested in having a class on homebuying brought to their organization should call Homeport at 614 221-8889 and ask for Housing Advisory Services Director Netta Whitman. Homeport Vice President of Neighborhood Strategy Leah Evans, right, was a presenter on March 16 at the Mid-Ohio Regional Planning Commission's insight2050 Academy. Over four Friday mornings in March, participants were challenged to critically think about planning for growth and development, ways to effectively communicate to engage the community, and to learn ways to network regarding the future of the area over the next 30 years. To learn more about the academy program, and hear what past participants have to say about it, click here. Pictured above, center, is Kurt Berry after his closing in March on a home in Greater Linden. On the left is real estate agent Melle Eldridge of Coldwell Banker/King Thompson. On the right is Brenda Moncrief. Homes in eight Homeport communities are eligible for purchase that previously could only be rented. If you live in Framingham, Greater Linden, Southeast Columbus, Kingsford, Mariemont, Joyce, Southside or Fairview Homes, you may want to contact Brenda Moncrief, Homeport Lease Option Program Manager at 614.545.4816, or on-line, to learn more about your options and the process of becoming a homeowner.